We humans do not like to be warned. I have worked on many fires and other emergencies where we had to warn people of imminent danger. Amidst the fear there was consistently a feeling of resentment, resistance, denial, that this peril could apply to me, my family, my life. Yes it may well affect others….but not me. But, if something is going to happen that will affect us, we want to know ahead of time, maybe. If something does happen and we weren’t warned…watch out, the blame game will be had and lawyers will be circling. But we don’t like warnings, especially those that challenge and threaten our behavior, lifestyle, and our security. Perhaps it is human nature, rooted in the garden, but there is a resistance to anything that threatens the silly myth that we are in control and that our lives are our own. The Bible readings for today contain words of warning. If you believe only in a warm and fuzzy concept of God and faith they are especially challenging. With the words of warning we also hear of tribulation. But, and this is very important, words of longing and welcome are clearly proclaimed. It is vital that we realize that it is because God does love us He warns us and He welcomes us to seek the return of His Son our Lord. WORDS of WARNING are shared clearly and powerfully by Christ in the Gospel reading. (At all times but especially this day, take the time to prayerfully read the CONTEXT of our readings). Jesus warns His followers of the coming time of tribulation. He speaks of the great period of tribulation that will precede His return. Volumes have been written and shared on this subject. Protestant Churches have been founded and divided on distinctive interpretations of the second coming and this period of tribulation. The early Christians were convinced it applied to them and their lifetime. Subsequent generations have shared the same conviction. Those drenched in the sorrows of the dark ages, persecutions, the Hitlers and Mao Tse Tungs that have come and gone would be difficult to convince that a tribulation could be any greater. These warning words of Jesus take fresh relevance, however, when studied in the light of current events in a global perspective. Global warming, oil depletion, a war of terror that no nation’s borders can resist all point to tribulation on a global scale. This compounded with a loss of moral conviction and commitment has hastened the current of time to an inevitable climax. This climax is linked to the conflict, the warfare spoken of in our first reading. WORDS of WARFARE were the unpopular message of Daniel the prophet then, and now. Yet Scripture, both Old and New Testament contain clear, loving warnings of this spiritual conflict. We as followers of Christ are involved in this warfare. Daniel spoke of secular conflicts that were occurring and would occur in anticipation of Christ’s coming. Like darkening clouds on the horizon beckon a coming storm so the events of life and world warn of and are the battleground of this conflict of Heaven and hell. These conflicts would reveal the warfare between our Lord God and Satan. The conflicts in souls as well, between faith and doubt, love and hate, lust and love likewise expose this warfare. 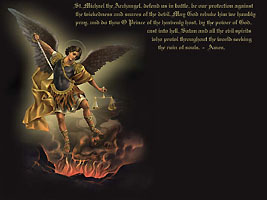 The prayer to St Michael the Archangel shared by Pope Leo XIII and that used to be prayed after every Mass affirms this reality and leads us to the victory, to God. To pretend this war isn’t happening will not excuse or dismiss us from being a part of it. And it is with God’s holy angels and saints we are called to hear share the clear message of welcome. WORDS of WELCOME are the closing refrain from God’s Word this day. From the beauty of Christ’s eternal sacrifice that wins this conflict over evil that is spoken of in the epistle we are called to know and share the sacrifice and victory of Christ crucified and risen. For it is in the Body and Blood of Christ that we find peace, whatever the circumstance, comfort, whatever the sorrow. It is at this place of sacrifice, His holy Cross we are called to choose whom we are going to follow and serve in this conflict. It is at His Cross we are welcomed to the hope and joy of His victorious embrace.